We have Knowledge- and Experience. Alison Buehler is a Certified Professional Dog Trainer (CPDT-KA) and is a Professional Member of the APDT. Alison currently works closely with private clients around NYC, teaches group classes in Basic Manners and Puppy Training and is a part-time Behavior Counselor for the ASPCA. In 2015 she gave her time to a program on Rikers Island, teaching the residents there about positive reinforcement dog training. Her previous work experience includes being a dog groomer, veterinary technician, kennel and daycare employee, dog walker and pet sitter; all adding to her extensive knowledge of dogs. 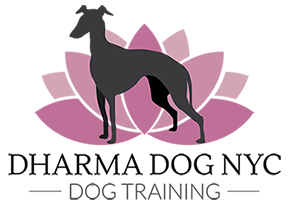 Her fascination with dog and animal behavior was inspired by her greyhound rescue, Bella. Through that guardianship, she now has personal and professional knowledge on Separation and Isolation Anxiety. She brings that knowledge, compassion and warmth to her training style. She has formally studied with top force-free trainers Rikke Brogaard, Jenny Chun and Viviane Arzoumanian, who she now also works with. She is fully committed to using only the most ethical force-free means to train, and strives to continue learning and teaching how we can best reside and thrive with these amazing and devoted friends.